Alex Voorman, a cerebral thirty-year-old archaeologist, is married to the woman of his dreams -- a beautiful, ambitious botanist named Isabel. When Isabel is killed by a reckless driver, Alex reluctantly consents to donate her heart. Janet Corcoran, a young, headstrong mother of two and an art teacher at an inner-city school in Chicago, is sick with heart disease. She is on the waiting list for a transplant, but her chances are slim. She watches the Weather Channel, secretly praying for foul weather and car accidents. The day Isabel dies, Janet gets her wish. Flash forward a year. Janet sends Alex a letter. She'd like to learn something about the woman who saved her life. But Alex isn't interested in talking to the recipient of his dead wife's heart. Since Isabel's accident, he's still grief-stricken. Meanwhile, a local blues musician named Jasper, the man responsible for Isabel's death, attempts to atone for his misdeed. 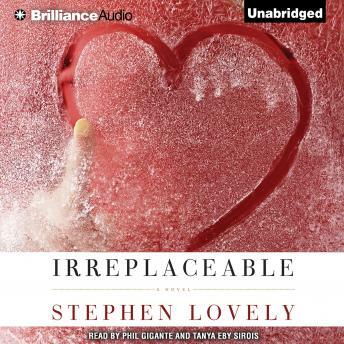 Irreplaceable is the story of what happens after the transplant -- not only to Alex but within the concentric circles of family that spiral outward from him and from Janet. Stephen Lovely takes us vividly inside the lives of these characters to reveal their true intentions -- however misguided -- and gives us a stunning debut novel of loss and love.